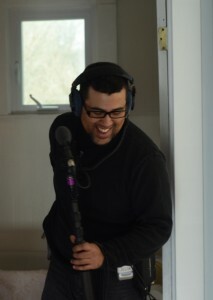 A: Boom Operator – I was responsible for capturing the dialogue via the microphone on the boom. Q: What was your favorite moment on set during production? 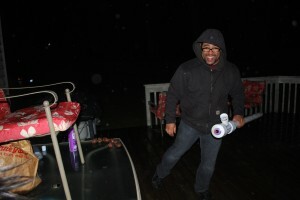 A: My favorite moment on set was finally nailing a very complicated tracking shot that involved perfect execution of choreography between talent, camera, and myself. The shot moved between two floors and had very emotional moments. Q: Working for 10 days straight and then two pickup days fairly soon after leads to much exhaustion. How did you keep yourself fresh and focused during such an intense time? A: The people around me helped to keep me focused; there were moments of great levity on set. In general, people had great attitudes about what we were making and the teamwork was always strong. Beyond that…lots and lots of coffee. Q: Do you have a reel, website, or do you want to tell us a little bit more about yourself and how people can follow your career or reach out to you? A: I don’t have a website, but you can check up on my filmography at IMDB!